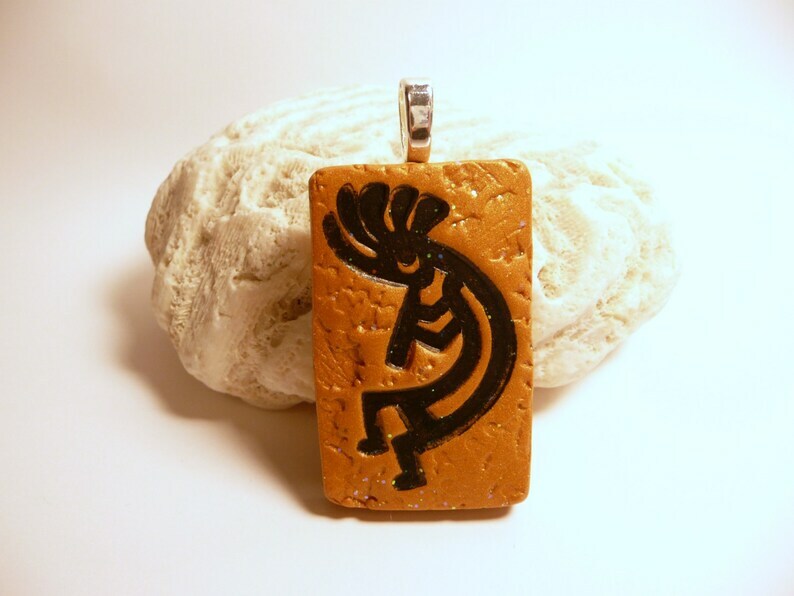 A unique kokopelli pendant (optional necklace) features a kokopelli figure stamped in black ink on a gold polymer clay background, textured to look like an ancient rock wall. Sealed with acrylic gloss with tiny sparkles. Measures approximately 1 3/4" tall x 1" wide (4.4 cm x 2.5 cm) plus a large silver plated aanraku bail. HANDMADE TO ORDER: Each one will vary slightly from the samples shown. A fertility god, prankster, healer and story teller, Kokopelli is a sacred figure to many Southwestern Native Americans. Carvings of this hunch-backed flute-playing figure have been found painted and carved into rock walls and boulders throughout the Southwest, dating back to the first petroglyphs some 3000 years ago. CUSTOM ORDERS welcome...you may request any light colored background finished as a pendant, pin (brooch) or magnet.